A while ago I was fortunate to test Marte's first commercial pattern. Marte blogs at Compagnie M., a wonderful place to visit to get inspired. Here is my version of the Mara blouse. 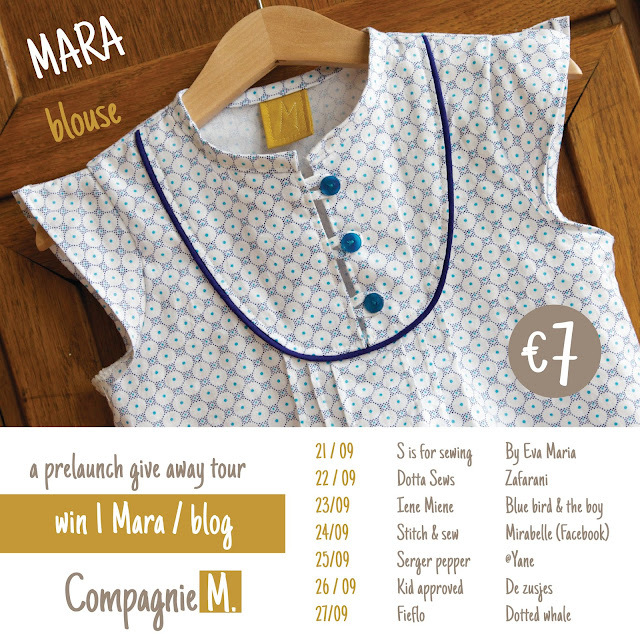 Marte generously offered to give a copy of her new pattern to Kid Apprived readers. Enter below for a chance to win. One person will be chosen to receive the pattern. But don't worry if you are not the lucky one, every one who enters a giveaway is eligible for a 10% discount. Pretty sweet! The Mara blouse is a feminine blouse for girls with a touch of vintage. With several sleeve & dress options the perfect pattern for endless sewing fun! § Sizes: 1y, 18 months, 2y, 3y, 4y, 5y, 6y, 7y, 8y, 9y, 10y. § Three sleeve patterns are included: butterfly, flutter or long sleeves. The flutter sleeve & long sleeve can also be combined. Sleeveless is of course also an option. § Two tutorials to easily adjust the blouse to a basic A-line dress or a gathered skirt dress. Detailed drawings will guide you through this process. The pattern includes all sleeve options like mentioned above. The pattern doesn’t include the dress options. Marte wrote two very detailed tutorials that will guide you through drawing your own dress version perfectly. This way you can adjust the pattern to a basic A-line dress & a gathered skirt dress. The pattern is a PDF file, easy to print (on A4 or letter size paper) and to assemble. The instructions contain easy-to-follow instructions with full color pictures of all steps. The measurements are both provided in centimeters and inches. Posted it to fb too. Your version is so sweet! I bet it gets a lot of wear. Linda blusa y con muchas opciones para coser!! !